Aside from being a fun exercise, what purpose does something like this have? None that's plainly obvious. Its about as useful as a miniature ship in a bottle. Yet it does have an underlying purpose. It could inspire someone to look beyond the perceived constraints of web designers and developers. This project was created by layering several empty divs over each other with transparent PNGs as background images. The structure of the divs closely resembles our diagram. None of the DIVs has the width attribute specified so they will expand to fill the size of any browser window they are displayed on. NOTE: All the images that make the background scenery parallax effect are 9999px wide. Well beyond the width of any computer display or television in common use. We’ll use CSS to place the background images exactly where we want within each particular div. The CSS for this project is just as simple as the markup. Absolute positioning is used to pull any header or paragraph text 9999px to the left of the screen. Then we declare every DIV in the page position: relative. By making all the DIVs position: relative;, we now have the ability to the use the z-index property to reverse the natural stacking order of the robot DIVs. Disclaimer: The original script to animate the robot was horrid. The good folks at coding cyborg were kind enough to clean it up and re-write it. We begin by re-affirming the original background position of all the images. Upon clicking the ‘#klicker’ div, a function tells jQuery to animate the backgrounds from their current position all the way to the coordinates specified for each div. By separating all the different image layers into different DIVs we can animate the background elements at different speeds. Moving the elements at different speeds gives an illusion of a 3rd dimension. We move the elements in the background at a much slower rate than the elements in the foreground. Notice on this animation that the speed of the clouds in the background is slower than the speed of the mountains. And the mountains are slower than the ground which is the fastest of all. Finally after firing off all these commands to get the background moving the ‘#klicker’ function calls on the ‘startHim()’ function. The ‘startHim()’ function, you guessed it right, starts our robot. It begins his little bounce and gets him moving to the center of the #wrapper div. The ‘startHim()’ function calls on the ‘bounceHim()’ function. And then it keeps looping. We need to make the robot seem like it was bouncing on a rough desert rode. To achieve that bouncy irregular effect we’ll use the ‘bounceHim()’ function. 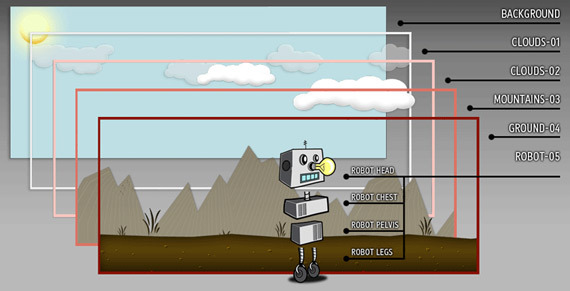 It targets the separate robot DIVs and ‘bounces’ them 5px up and then 5px down. That wont be enough though, all the different pieces of the robot bouncing at the same rate looks too stiff. We need to make it look a bit more random and interesting. So we’ll take the div that makes the chest portion of the robot and move it at a different rate than the head and pelvis pieces. We’ll ‘bounce’ the chest part at 8px up and 8px down. This gives the robot a nice off-beat bouncy effect. The ‘leaveScreen()’ function is the last function called. After 15 seconds (15000) it moves the robot 100% percent to the left of the screen which consequently moves the robot off to the right of the screen. Anthony Calzadilla is an independent web designer based out of Miami, FL. USA. Really nicely done! I would recommend caching some of those selectors, but a really nice concept. Wow, I agree… very nice! It's interesting to see how far we try to push web design sometimes. I like this a lot!!! This is very cool. I had NO idea that jQuery was able to do animations of that scale. Very cool! I love this type of jQuery stuff! Nice job! Very cool! I love things that take functionality away from flash! Very impressive that jquery that handle such "animation" tendencies. I kept right clicking waiting to see the Flash Player pop up, but nope! AMAZING! Not very semantic though ;). That sums it up perfectly. It’s absolutely annoying having to go back and rework animation. I don’t necessarily agree with this statement. Using techniques like this means your information is still easily accessible by screen readers, search engines, and the like. And you still get sweet animation. Simply put, mastering this technique is having your cake and eating it, too. Inspiring! This have given me a great idea for a very useful / educational “app”. Didn’t I see this exactly same thing before? I can swear that I did. Did you write this for another website and publish it before? jQuery is a powerful library that continues to impress me…this is a very cool experiment and extremely useful for the non-flash folks out there. Great tutorial, but wouldn’t it be easier to do this in flash. I mean it might be more accessible but it seems an awful lot of effort for something so simple. brilliant boundary pushing. inspirational. you rock my socks! P-town represent! You should have made it a hipster robot. I am totally impressed.. way to go developers! Way to go jQuery! Hi all, I’m glad you guys liked the tut. Big thanks to Chris for posting it here! Does it sound, does it scale ? Never ever this will replace flash…why should it, btw ?? Very nice tutorial. I always planned to add some little animation my website, but didn’t feel like going the Flash way. Now I see I don’t have to. Very cool, will I every need this?